Welcome to the Voyageurs National Park Information Page. Voyageurs National Park is located in north central Minnesota on the Canadian border in the Rainy Lake area. The Park is located on the northern border of Minnesota, 55 miles of the park stretch along the Ontario border. Voyageurs is about 15 miles east of International Falls, Minnesota and 300 miles north of Minneapolis – Saint Paul, Minnesota (five hours by car), three hours from Duluth, Minnesota, and four hours from Winnipeg, Manitoba. The Boundary Waters Canoe Area Wilderness lies to the east of the park. The park lies in the southern part of the Canadian Shield. Voyageurs is a water based park. Access to the Kabetogama peninsula, the islands and nearly all of the park’s shoreline is by watercraft. Free public boat ramps and parking are available at the park’s visitor centers and at the Kabetogama State Forest Campgrounds. Watercraft rental and water taxi service are available from private outfitters and resorts at each of the park’s four gateway communities – Ash River, Crane Lake, International Falls and Lake Kabetogama. The closest major airport is Minneapolis – Saint Paul. There is a smaller airport in International Falls, Minnesota. 1. The only entrance from the North would be by boat. The park is bordered by water and Canada on the North. 1. Take I-94 North to Highway 53 North to the park. 2. Take I-94 North to Highway 71 North to the park. 1. Take I-35 North to Stateroad 33 North to Highway 53 North to the park. 1. Take Highway 2 East to Highway 71 North to the park. Roads approach the park from four points along Highway 53 between Duluth and International Falls. County Road 23 from Orr leads to Crane Lake at the park’s east end. The Ash River Trail (County Road 129) takes you to Ash River. Stateroad 122 leads to Kabetogama. Minnesota Highway 11 East from International Falls leads to Rainy Lake on the northwest end of the park. For those coming to the area by plane, there are local airlines that serve Hibbing and International Falls, Minnesota; and Fort Frances in Ontario, Canada. There hasn’t bus service between Duluth and International Falls. Public Law 91-661 as amended by Public Law 97-405 was enacted by the U.S. Congress on 08 Jan 1971, to “preserve, for the inspiration and enjoyment of present and future generations, the outstanding scenery, geological conditions, and waterway system which constituted a part of the historic route of the Voyageurs who contributed significantly to the opening of the Northwestern United States.” Voyageurs National Park was officially established under these laws by the Secretary of the Interior on 08 Apr 1975. “The uniquely scenic and historic Voyageurs National Park, 36th in our National Park System, stands as a monument forever to the dedicated citizens and conservation organizations whose vision, ingenuity and courage matched the splendor of this superlative wilderness area. 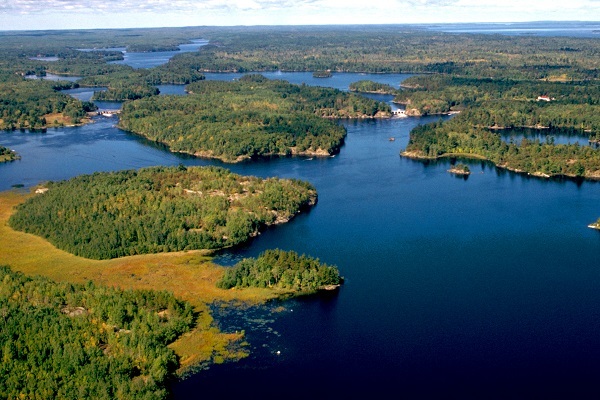 Water dominates the landscape of Voyageurs National Park; within its boundaries, more than 30 lakes fill glacier-carved rock basins. Four large lakes – Rainy, Kabetogama, Namakan and Sand Point – cover almost 40 percent of the 218,054 acres of Voyageurs, making it one of the few water-dominated parks in the National Park Service system and the only park unit draining northward to Hudson Bay. Hundreds of rocky islands and a myriad of coves and bays are scattered throughout these large lakes. In the midst of all this water lies the Kabetogama Peninsula, a 75,000 acre roadless land mass. The topography of the peninsula and much of the rest of the park is rugged; rolling hills are interspersed between bogs, beaver ponds, swamps and smaller lakes. Park visitation is highest from May through August when boating, camping, fishing, wildlife-watching and hiking are the main visitor activities. In the fall, canoeists and kayakers can experience the beautiful colors of Voyageurs during a season with less visitors and few insects. From January through March, the park is a primary destination for winter snowmobile vacations. The Kabetogama Lake and Rainy Lake Visitor Center and the concession-operated tour boats are accessible. The main floor of the Kettle Falls Hotel and the trails, docks and villas at Kettle Falls are all accessible. The first half of the Oberholtzer trail at the Rainy Lake Visitor Center, the Beaver Pond Trail, Kabetogama Lake Overlook Trail near the Ash River Visitor Center are all fully accessible. The park also has a fully accessible campsite, with lift, on Namakan Lake that is available by reservation at the Kabetogama Lake Visitor Center. Wild Berries are half the size but twice as flavorful as tame berries! Be sure to know what you are picking. Strawberries can be found in open sunlit areas starting in mid June. Blueberries can be found on rocky ridges from mid Jul to mid Aug.
Cranberries are ripe in the bogs around the beginning of Oct.
Chokecherries ripen mid Jul on small trees. Raspberries found in the disturbed areas ripen throughout Jul. Juneberries or Shad bush tree fruit are ready in late Jul. Boating and fishing are the most common recreational uses of the park. Known as some of the best walleye water in the nation, the lakes have attracted sport fisherman long before the park was established. A Minnesota fishing license is required. Boats must be licensed in your state or in Minnesota. Chainsaws may be used to cut ice fishing holes. Boat tours are provide by a concessioner on Lake Kabetogama’s “The Sight-Sea-Er” and park operated on Rainy Lake. Trips offered include sunset cruises, wildlife-watching cruises and cruises to the historic Kettle Falls Hotel; most trips are naturalist-guided. Reservations are recommended; call 888-381-2873 for reservations. There are over 150 boat-in campsites distributed throughout the park designed for either tent camping or houseboats. Designated tent sites have a mooring post, tent pad or level area, fire ring, privy, picnic table and bear-proof food-storage locker. There are no entrance fees. There is no charge for campsites within Voyageurs National Park, although a free permit is required. All campsites in the park are accessible only by boat. There are NO drive-to campsites in Voyageurs National Park. You may tow in your own watercraft. Voyageurs National Park charges $10.00/day per boat for the Boats on Interior Lakes Program. There are restaurants and grocery stores on the periphery of the park. The historic Kettle Falls Hotel offers lodging within the park. Often called the “Jewel in the Wilderness,” Kettle Falls is accessible by boat, floatplane, and snowmobile. It is a concession-operated complex that includes a dining room, bar and rooms in the historic 1912 motel and modern housekeeping villas. Kettle Falls offers a portage between Rainy Lake and Namakan Lake; gasoline can also be purchased. All overnight use in Voyageurs National Park requires a free permit. Permits can be obtained at park visitor centers and boat launches. One permit per party per overnight stay is required. Pets are allowed in developed areas, around visitor centers, boat launch ramps, picnic areas, and campsites on the four main lakes. They must be restrained on a leash not more than 6 feet lond and under your control. Pets are not allowed on park trails or in the backcountry. During the summer season, naturalists offer interpretive walks, evening programs, children’s activities, canoe trips, a junior ranger program and North Canoe Voyages. Schedules of these activities and their locations are available at each of the visitor centers. Regular showings of a short park film and interpretive exhibits at the visitor centers provide an excellent overview of the park’s natural and cultural resources. Information on camping and other park recreational uses is also available. The park has a cool continental climate with short warm summers followed by long winters. Average summer highs range from 60° F to 80° F; winter highs range from 10° F to 30° F. The boating and canoeing season begins as early as the end of April and lasts until freeze-up sometime in November. The winter snowmobile and ski season generally begins in late December. Annual precipitation averages 28 inches.